See more objects with the color wheat dimgrey darkgrey peru darkolivegreen or see all the colors for this object. This is a Pleated fan. 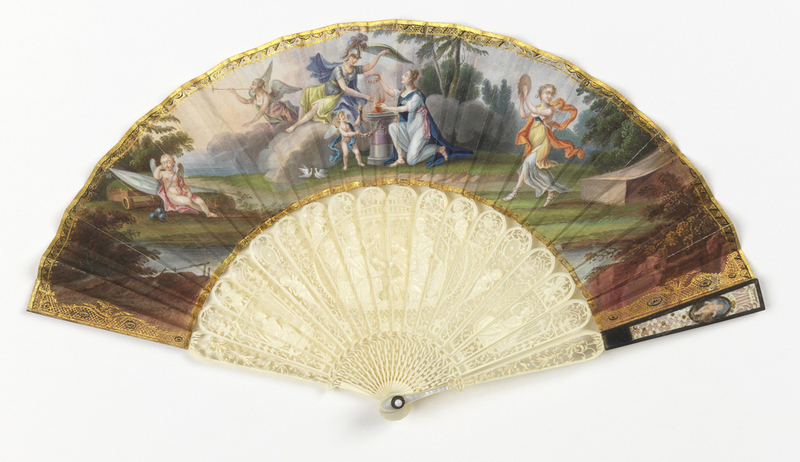 It is dated 1800–1810 and we acquired it in 1952. Its medium is paper leaf backed with parchment, gilded and painted with watercolour, carved and pierced ivory sticks with silver and gold spangles, mother-of-pearl plaque at rivet. It is a part of the Textiles department. This object was featured in our Object of the Day series in a post titled Small is Classically Beautiful.